This note was originally published at 8am on May 31, 2011. INVESTOR and RISK MANAGER SUBSCRIBERS have access to the EARLY LOOK (published by 8am every trading day) and PORTFOLIO IDEAS in real-time. John Milton was an influential 17th century poet who “wrote at a time of religious flux and political upheaval in England” (Wikipedia). His most famous writing was “Paradise Lost.” His most enduring life lesson was to challenge the Perceived Wisdoms of the State. F.A. Hayek cites Milton’s aforementioned quote in “The Road To Serfdom” (page 210) in order to introduce Chapter 14, “Material Conditions And Ideal Ends.” Hayek goes on to remind us that: “Though it is natural that, as the world around us becomes more complex, our resistance grows against the forces which, without our understanding them, constantly interfere with individual hopes and plans…” (page 211). In the face of Global Macro Markets waking up to further Government Interference in the free-market pricing of Greek risks this morning, considering Milton and Hayek’s thoughts on the matter seems just and reasonable to me. Ok. So what does that mean? Does it mean that the first 110 BILLION Euros ($158B US Dollars) allocated to the Greeks was a success? Does it mean that socialist bailout policies have gone global? Why don’t they throw another 30-60 BILLION at this sick puppy and see? Obviously, this gargantuan global experiment in Fiat Fool policy has crossed its proverbial Rubicon – or I wouldn’t be in a position to ask such ridiculous questions. I do not think doing more of what isn’t working is a good idea. 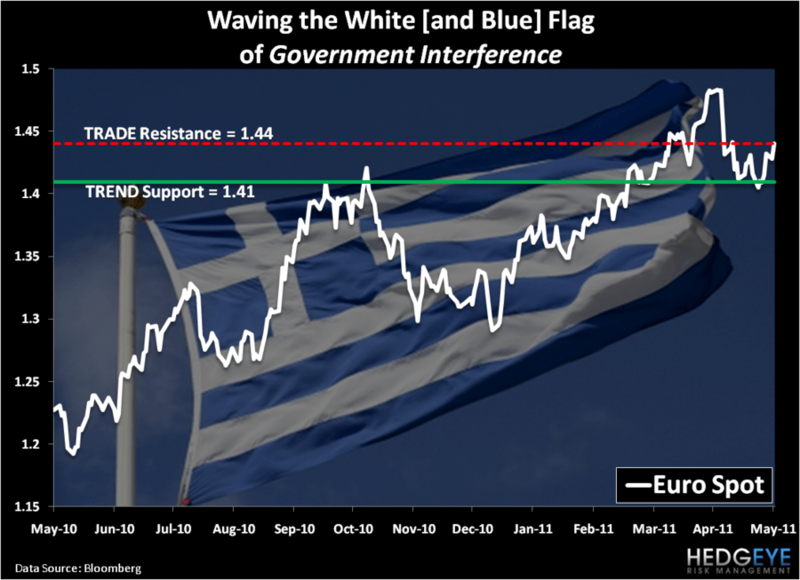 I do not think Greece’s structural economic implosion will end by June either. So don’t get upset about it – capitalize on it. In other words, while it’s nice and tidy to tell ourselves stories that our long positions are all off to the races again, we’ll stop, take a breath, and remind ourselves that all this Government Interference in Europe means is that we’re going to have heightened market volatility in June. In order to capitalize on that thought, all you really have to do (for now) is stay ahead of the next big moves in the US Dollar Index. This morning, with the Euro up at $1.44, the USD Index is down at $74.59, if this US Dollar Index level holds, I’ll make LONG US Dollar (UUP) at least a 9% position in the Hedgeye Asset Allocation Model. As you know, being long the US Dollar isn’t exactly what my Canadian craw should be considering – given my “long-term” view. And that’s exactly why I think the position makes so much more sense from this price. If the Europeans are actually serious about “ruling out restructurings”, what is going to be bearish for Euros in the intermediate-term is going to be bullish for Dollars. The summary risk management point embedded in currency, equity, and bond markets here in the United States of America is that Growth Is Slowing. This isn’t a new Hedgeye view. But it is becoming a consensus one. 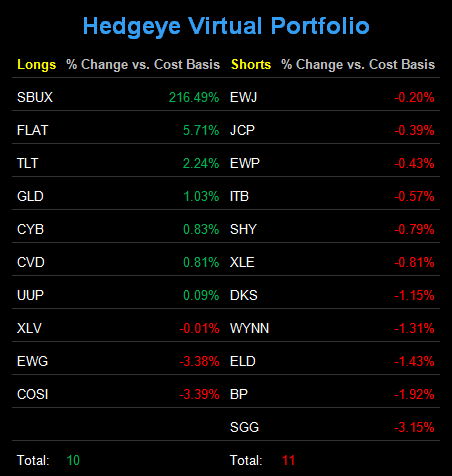 Lower prices in US Equities had me cover our short position in the SP500 last Monday (time stamped @Hedgeye at $131.95 SPY on 5/23/11) and take up my US Equity exposure from ZERO percent last Monday to 3% this morning (I know – call me a horned up bull!). Is it “just or reasonable” to have not lost money in the month of May? Is Government Interference the best path to long-term economic prosperity? These are simple questions for a complex macro market – and it’s our job, as your Risk Manager, to answer them in real-time. My immediate-term support and resistance ranges for Gold, Oil, and the SP500 are now $1512-1543, $99.65-101.89, and 1323-1340, respectively.